Mr. Abdur Rahman Junaid successfully completed his LLB from University of London (UK), Diploma in Law from University of London (UK) & LL.M in International Law and Human Rights from London South Bank University, UK. Prior to joining the Chambers, Mr. Junaid has previous experiences in the education and social welfare & development sector. His knowledge on the International laws along with a keen legal mind renders him into a valuable asset to the Chambers. Mr. Junaid is a valuable member of Consultancy and Documentation Team. He provided very able assistance in several assignments of different clients notably winding up and bankruptcy matters. Besides, his due diligence report involving customs duty for a number of foreign clients was highly praised by clients. Drafting legal notices, Winding Up petition for Vector Aerospace Engine Services- Atlantic against a local Airline. Drafted Provident Fund policy & also Provident Fund Trust deed for Giant Agro Limited. 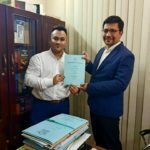 Drafting Factoring Agreement signed between First Security Islami Bank Limited & PrimaDollar regarding factoring of international trade receivable. Mr. Junaid is a member of both Commercial and Corporate Departments.